The Gas Market Operator for Northern Ireland (GMO NI) became operational from 1st October 2017 and is responsible for managing the commercial rules and all trading and transactional aspects of the gas transmission market in Northern Ireland. 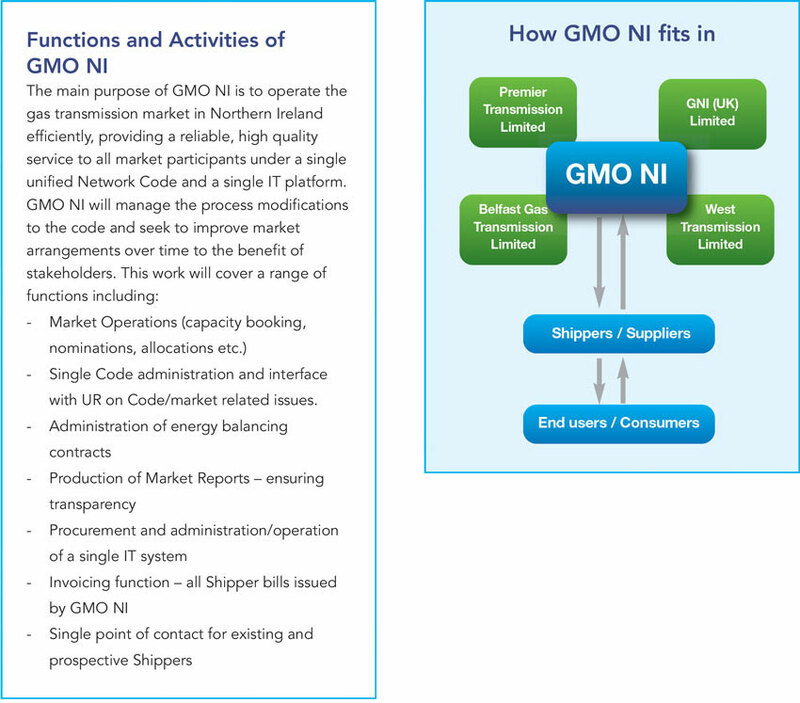 GMO NI is a collatoration of the four Transmission System Operators (TSOs) in Northern Ireland. The purpose is to provide a ‘one stop shop’ for the commercial activities of the TSOs, which can otehrwise be described as operating the gas market. Previously the gas transmission market was operated by four separate Transmission System Operators (TSOs): Premier Transmission Limited (PTL), Belfast Gas Transmission Limited (BGTL), West Transmission Limited (WTL) and GNI (UK) Limited. PTL, BGTL and WTL are all subsidiaries of Mutual Energy Limited. Previously they commercially operated the gas transmission network through four different network codes and two separate IT platforms, with only some elements being streamlined to gain efficiencies. The Utility Regulator has sough to create a commercial single system operator of the transmission network in Northern Ireland to fully streamline commercial operational activities. A contractual arrangement between the TSOs led to the formation of GMO NI, which will manage and administer a single network code and IT plafrom as a single entity, therefore delivering efficiencies for their customers into the future. For further details on GMO Northern Ireland, including in relation to the NI Network Gas Transmission Code or the Connections Policy, visit the GMO NI website www.gmo-ni.com or contact GMO NI on 028 9590 9250.